There is a new teaser in town. 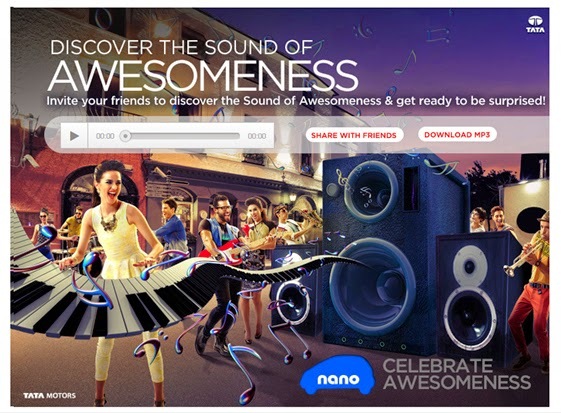 ‘Celebrate Awesomeness’ is the new campaign from TATA Motors for the refreshed 2013 Nano targeted at the youth segment. The brand is leveraging social media, namely Twitter and Facebook to pique user interest and has released a new techno jingle in the run-up to the commercial launch. Discover the Sound of Awesomeness is an app on Facebook that plays out the new jingle, allows fans to share it on Facebook and download the Mp3 file. The jingle is also available in various edits for use as mobile ringtones. The campaign is being pushed via Promoted Tweets and Facebook posts for Nano’s 3.8million fans. On Twitter the brand kept the #NanoAwesomeness buzz alive all through last week with contests and interactivity. Participants were asked to creatively complete the Teaser video posted on Youtube. The launch event is scheduled for tomorrow and it will be interesting to see how the brand ramps up the campaign across digital media.